August 22, 2018, Dublin, Ireland. 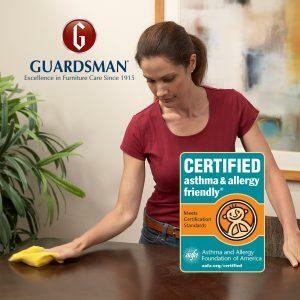 Allergy Standards Limited (ASL), the International standards and Certification Body (CB) for allergy labelling, today announced that Guardsman® Dusting Cloths have passed the relevant Certification Standards. How did the Guardsman® Dusting Cloths obtain the Certification? This ASP: 09-03 Certification Standard is targeted to non-disinfecting Handheld Dusting Products and Wipes products that are scientifically proven to reduce exposure to asthma and allergy triggers. The Certification Standard utilizes an algorithm of proprietary and recognized scientific techniques to assess non-disinfecting cleaning products for their ability to reduce allergenic and irritant materials. Product samples that pass certification testing are granted a certificate stating that the particular dusting cloth item meets the requirements for the asthma & allergy friendly® ASP:09-03 Handheld Dusting Products and Wipes (Non-Disinfecting) Certification Standard. ASL subjects non-disinfecting surface cleaners to chemical testing to ensure that the product does not have properties that are likely to irritate both asthma and allergy symptoms in susceptible people. Their capability to remove allergen and particulate matter from hard surfaces while minimizing airborne allergens. The accumulation of the allergen on the product following cleaning, demonstrating that allergens are removed from the surface and not just redistributed. The presence of toxic constituents and the emission of volatile organic compounds (VOC) to ensure low toxicity. Guardsman then obtained the certification after the products they sent for testing passed the tests and met the scientific requirements. Guardsman has been a leader in furniture care since 1915, delivering quality products and services for the protection, care, and repair of wood, fabric, and leather furnishings and bedding products. Guardsman products include polishes and cleaners for fine wood, leather, and fabric furniture, as well as a complete line of furniture maintenance products for touch-up, repair and spot cleaning. Guardsman is also a leading provider of furniture repairs services. We visit hundreds of thousands of homes every year to successfully repair furniture—so you know our products work! With nearly a century of expertise in the furniture care business, Guardsman is an established and committed partner in maintaining the beauty and extending the life of your furniture.